Up until about 9 years ago, my exposure to Russian culture pretty much began and ended with those cute little matryoshka dolls, you know the ones that endlessly stack inside one another? To be fair, these are amazingly cute and even come in ninja form! But I digress. At any rate, until I met my future husband, Alex, I pretty much knew jack sprat about any Russian cooking at all. 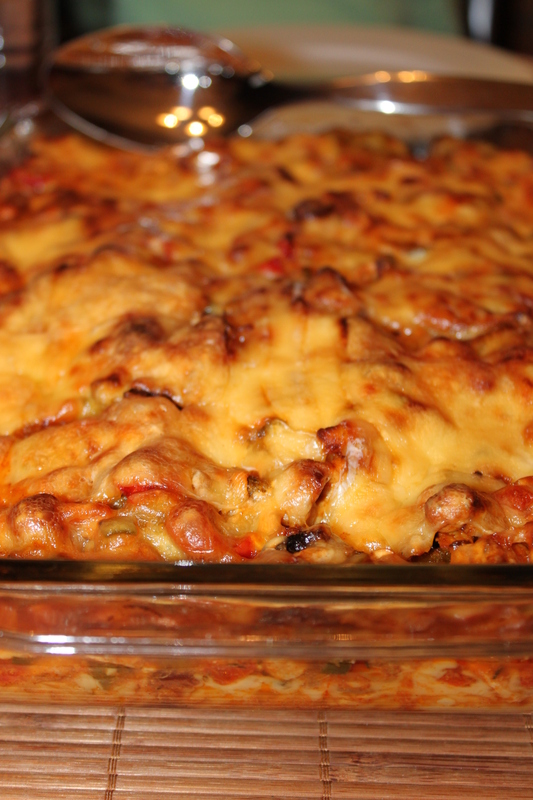 With winter in full swing, I found myself yearning for stick to your ribs type comfort foods. Maybe it’s the inner primitive instinct to eat heartier foods to better prepare for the winter hibernation, OR it’s just my inability to turn down a good, hot steaming bowl of delicious at any time, winter being no exception! I had earmarked this recipe ages ago and finally got around to giving it a go, but was remiss in posting it for you guys. What initially drew me to this recipe was the twist of creme fraiche over the traditional addition of sour cream. For those of you who’ve never used creme fraiche before, I’m here to tell you that it’s amazing. Gently tangy, creamy and rich, it’s the more sophisticated, adult version of sour cream. Couple that with a few generous splashes of cognac and you, my friend, will be exported to the richest, most luxurious bowl of stroganoff ever! Pat meat dry with paper towels and season generously with salt and pepper. Heat oil in large skillet or dutch oven until shimmering. Add in meat and cook until just brown, about 1-2 minutes. 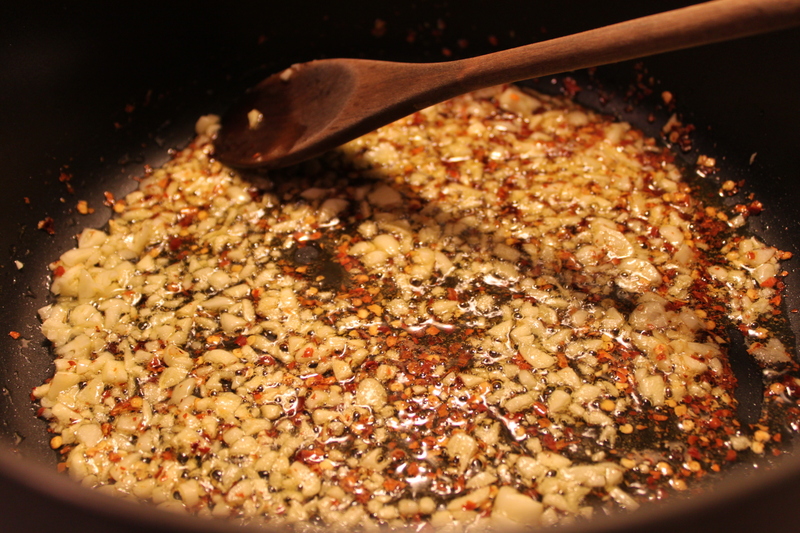 Remove meat and drippings to a separate bowl. Turn heat up to medium high and melt 4 tablespoons of butter in skillet. Add shallots and saute until tender and translucent, scraping bottom of pan frequently to remove frond. 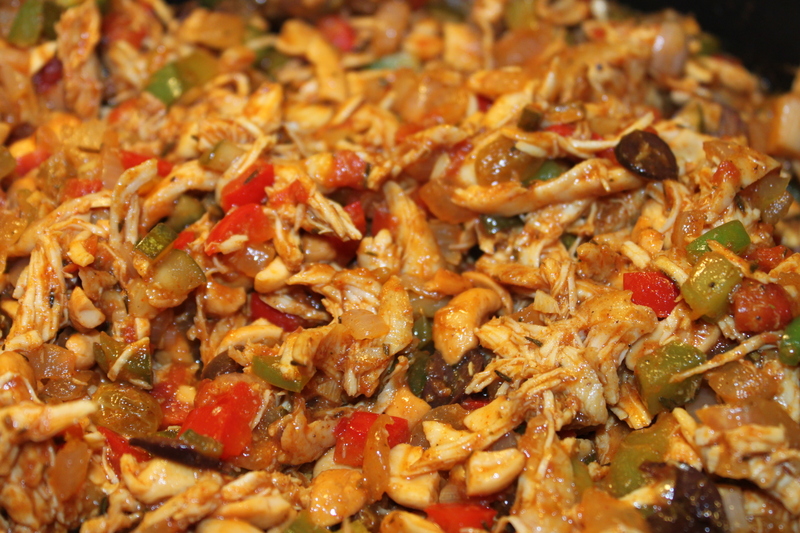 Add in mushrooms and continue to saute until most of liquid has evaporated. Add in beef broth and cognac and simmer until liquid thickens and coats mushrooms, about 15 minutes. While the stroganoff is thickening and reducing, bring separate large pot of salted water to bowl and cook noodles according to package directions. Drain and toss with remaining 2 tablespoons of butter. Season with salt and pepper. Once stroganoff has thickened, stir in creme fraiche and Dijon mustard until combined. Add in meat and any drippings to skillet and simmer over medium low heat until meat is just heated through and meat is still medium rare and tender, about 2 minutes. Stir in dill and season with salt and pepper to taste. To serve, divide noodles among serving plates, top with beef and generous amount of sauce and sprinkle with generous amounts of paprika. Buckle up and get ready to be transported to hearty comfort food heaven! Then, this past March, we were blessed with the birth of our son, Hunter, who has been quite the amazing handful! Needless to say, between juggling diapers, carseats, baby food, and work, my schedule has been totally crazy! On the good side, I’ve still been cooking and I have a bunch of recipes to post! On the bad side, boy do I have a lot of recipes to post!! I figure what better way to ring in the new year of 2014 than to get back to sharing with you guys my wonderful foodie adventures? 2014 New Year’s resolutions — blog more, check! Lose 20lbs, we’re going for it, check! Clean and organize my house, well we can all hope for miracles, right? To start off the new blogging year, I wanted to share with you one of my favorite and easiest dessert recipes EVER, Zuccotto. It’s an Italian delight composed of pound cake, liquor, whipped cream, and a smattering of chocolate and toasted almonds. I mean, how do you say no to that?!? One of the things that I love about this dessert, outside of the fact that it’s utterly delicious and amazing, is that it’s super easy AND, dare I say it, YOU don’t have to bake a thing! Yes, I’m saying that you can pull this off with store purchased pound cake and no one will be the wiser or judge you for it. Why? Because ladies and gents, while I’ll be the first to roll up my sleeves and get elbow deep into the cake flour, there are times (many in fact) where we just don’t have the time nor the energy to get down and floury! 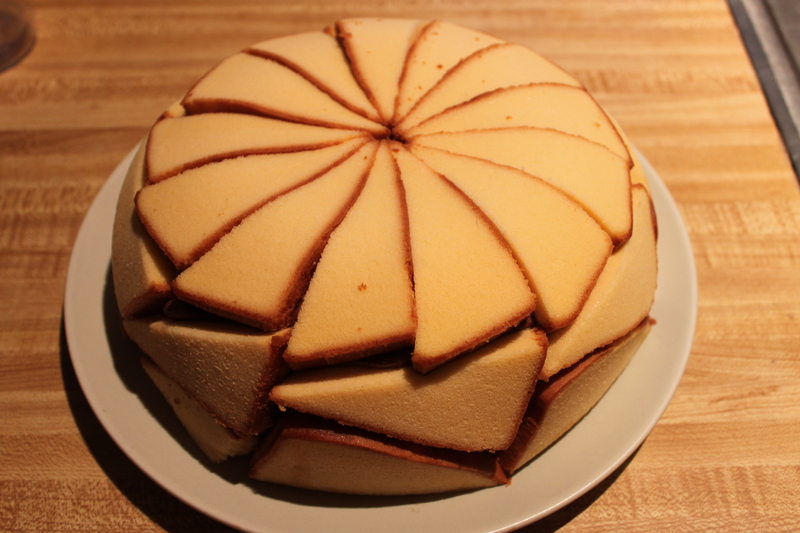 Any pre-made pound cake will do, however, I have personally found that the frozen Sara Lee ones work the best for me. You should make this a day in advance to let the flavors meld together and allow for the cake to soak up some of the liquor. Oh yes, I did mention there was liquor in this right? 🙂 Once set, the end result is a cake that looks sophisticated, tastes amazing, and is sooo easy to make. Spray your bowl with non stick cooking spray and then, using 2 sheets of plastic wrap, line the inside of the bowl completely. 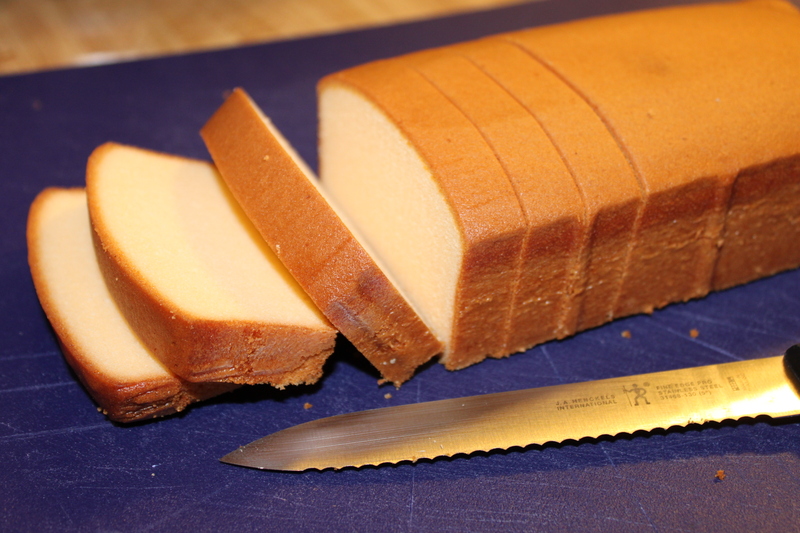 Cut the pound cake into 1/2 inch slices and then cut each slice diagonally to form triangles. Arrange cake triangles inside your bowl to form a starburst pattern in the center and then line the sides with remaining slices. Try to keep the slices as close together as possible and feel free to fill in any “gaps” with additional pieces of cake cut to size. Reserve the extra triangles or squares. 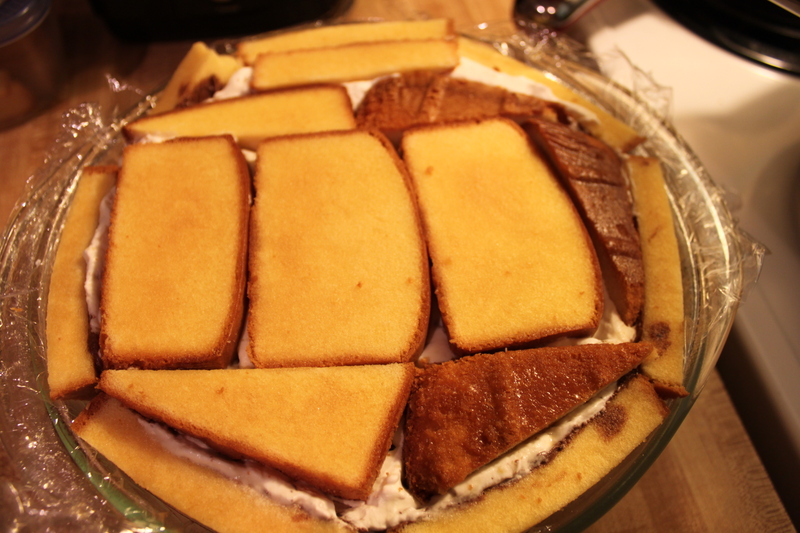 Once finished, brush all the cake slices with brandy or amaretto. In a separate metal or glass bowl set over a pot of simmering water, melt your chocolate, stirring until it is nice and smooth. Set aside and allow to cool slightly while you prepare the whipped cream. Using an electric mixer, beat 3 cups of whipping cream on high and slowly add in your powdered sugar until thick and fluffy. 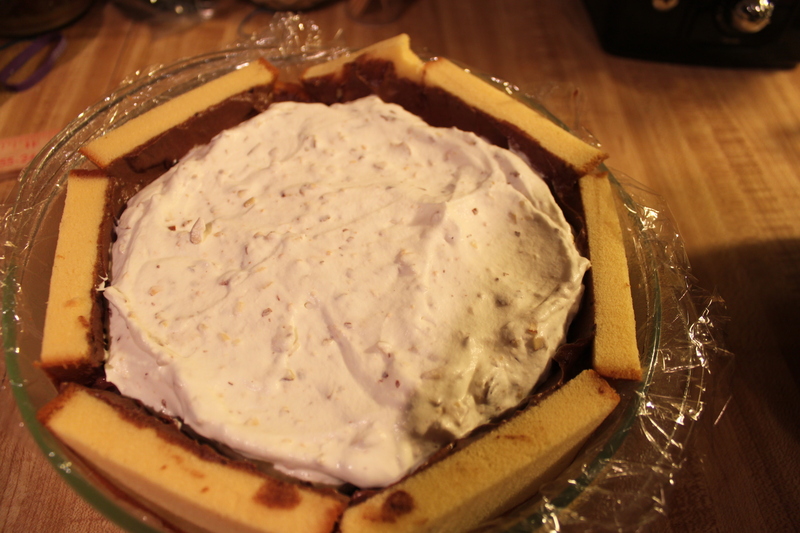 Gently fold half of the whipped cream into the chocolate bowl until combined. Spread chocolate whipped cream mixture and cover the pound cake in the prepared cake bowl, creating a well in the middle. Add toasted almonds, almond extract and vanilla extract to the remaining whipped cream mixture and fold gently until combined. Spread into the well in the center of the chocolate filling. 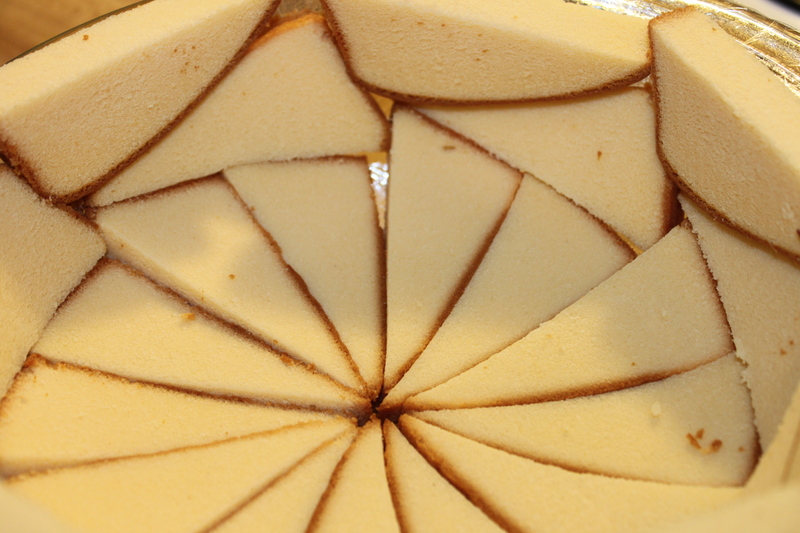 Top with remaining cake slices, brushed brandy or amaretto side down, to completely cover the filling of the cake, trimming the cake slices to fit, if necessary. Cover the cake with plastic wrap and refrigerate at least for 1 day. To serve, invert cake onto a platter, unmold and remove plastic wrap. Sift cocoa powder on top right before serving. I love pie. 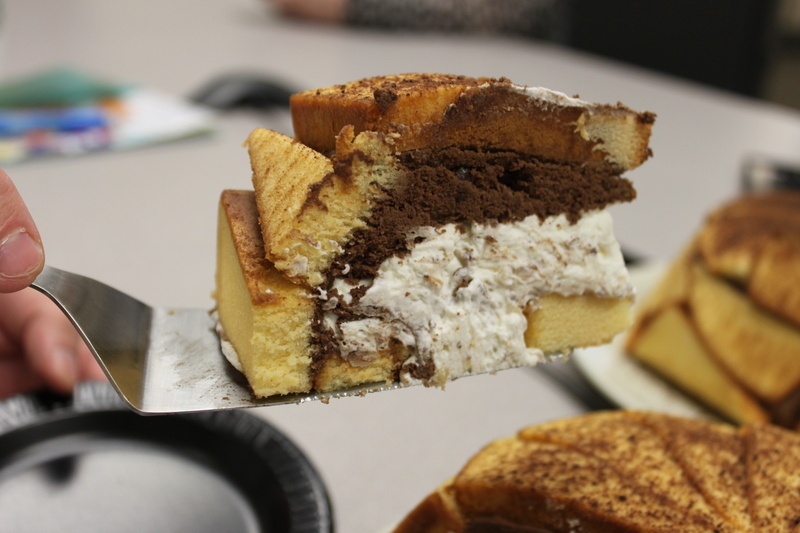 Don’t get me wrong…I’m always a sucker for the next new tiramisu or cheesecake that graces the menu, but in my heart of hearts, I will always love me a good ol’ fashioned slice of pie. Golden, flakey, fruit filled little packages of heaven. 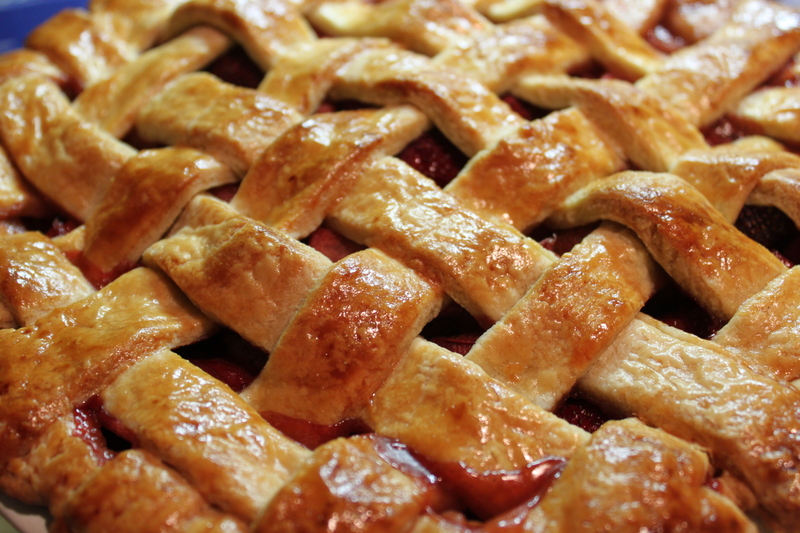 Seriously, have you ever met a slice of pie that you didn’t find charming? With the summer bounty in full swing and me having an unending supply of Jersey peaches *swoon*, I find myself thinking of nothing but peach pies. 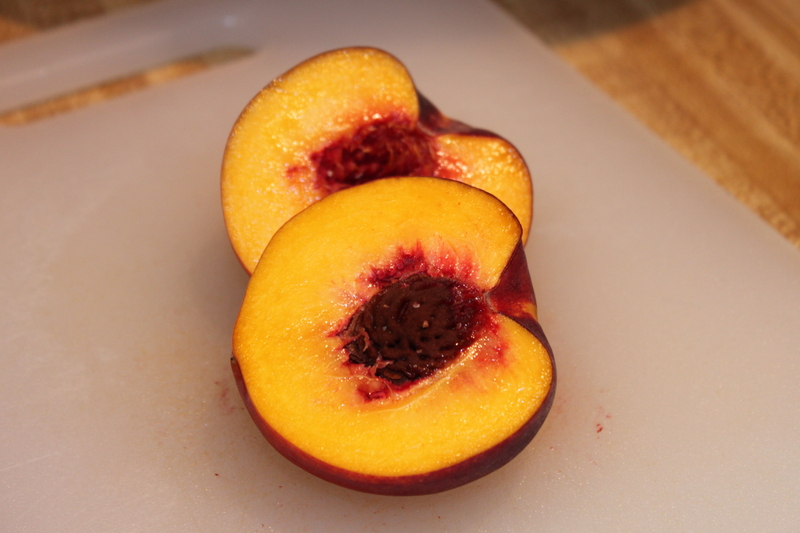 Granted, there’s something utterly magical about biting into a ripe, juicy Jersey peach that almost instantly transports me back to my childhood when my parents would take me fruit picking, but I wanted to make some new memories as an adult with my bounty of peaches! A pie worthy of my 35 years of concocting in the kitchen! So let’s talk pie fillings. This is where we can get super creative, right? Everybody always looks to the crust as the first indicator of a great pie, but let’s face it, it’s the amazing filling inside that really makes your heart sing! A great crust will never be enough to save a lackluster filling which is why I totally fell in love with this recipe. ost fruit pie fillings consist of fruit, sugar, cornstarch, and maybe some juice. This recipe calls for addition of cardamom which, I’m telling you, if you’ve never added to fruit pies, you’re missing out! 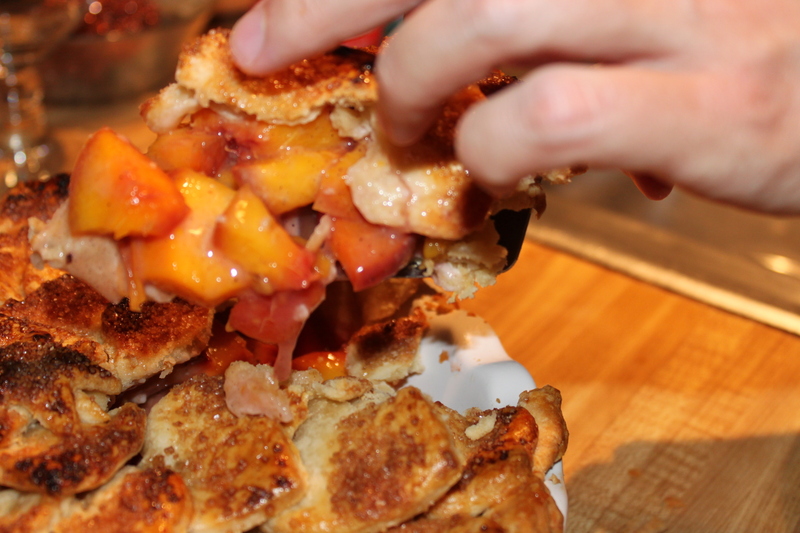 Cardamom adds that extra ooomph of flavor and lifts this peach pie up to the next level. 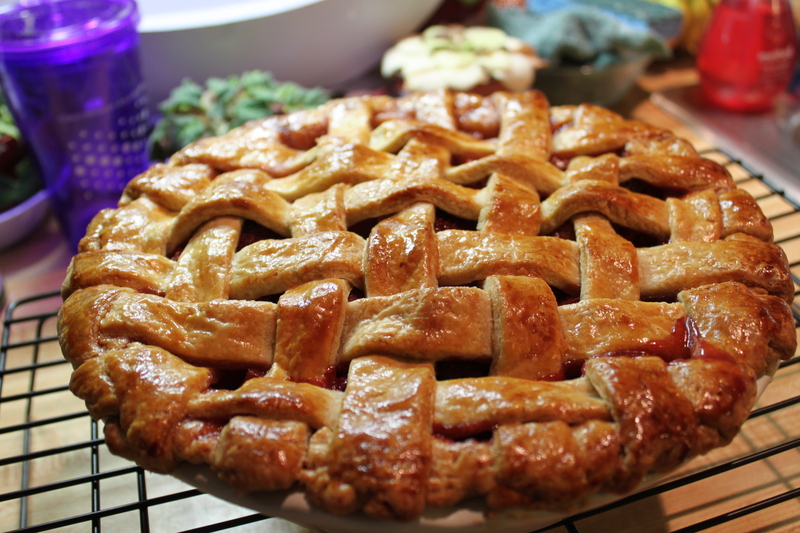 So for you flavor savors out there, this pie is for you! I changed the recipe of this pie from a single crust to a double one because, well, golden, flakey crust. Hellooo? Plus, call it my OCD, but I like having my pie slice “contained” if you will with 2 beautiful crusts. 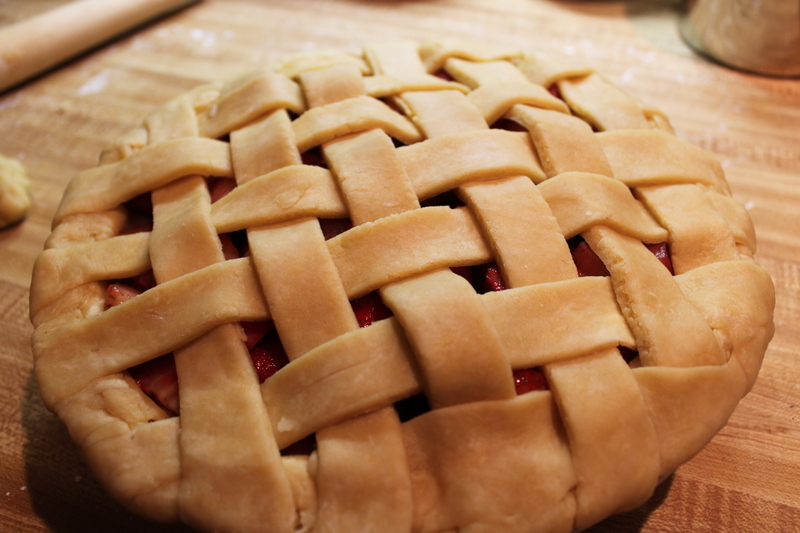 The top crust does take a bit of effort to roll, cut, and re-roll, but the end result is a pie that is so delectably cute, your heart will absolutely melt. I know I sure did. For crust, blend flour, sugar and salt in processor until well mixed. Add in butter, pulsing mixture until it resembles very coarse meal. Add in 6 tablespoons of water and continue pulsing until moist clumps form. Add in additional water by the teaspoonful if dough is too dry. Turn out dough onto lightly floured surface and knead gently until dough comes together, approximately 4 to 5 turns. Divide in half. Flatten each half into a disk and wrap tightly in plastic wrap. Chill at least 1 hour or up to 1 day. Roll out 1 disk onto lightly floured work surface into an 11 inch round. 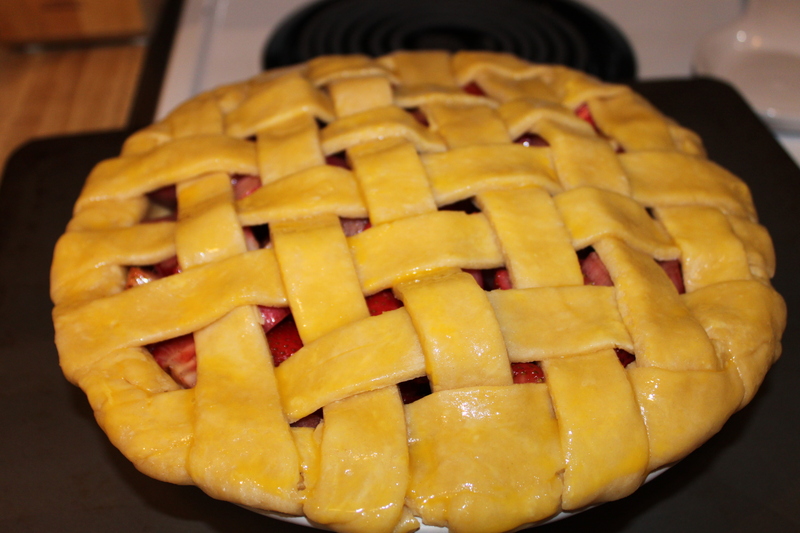 Place and center into a 9″ diameter glass pie dish. Set aside and chill in fridge. 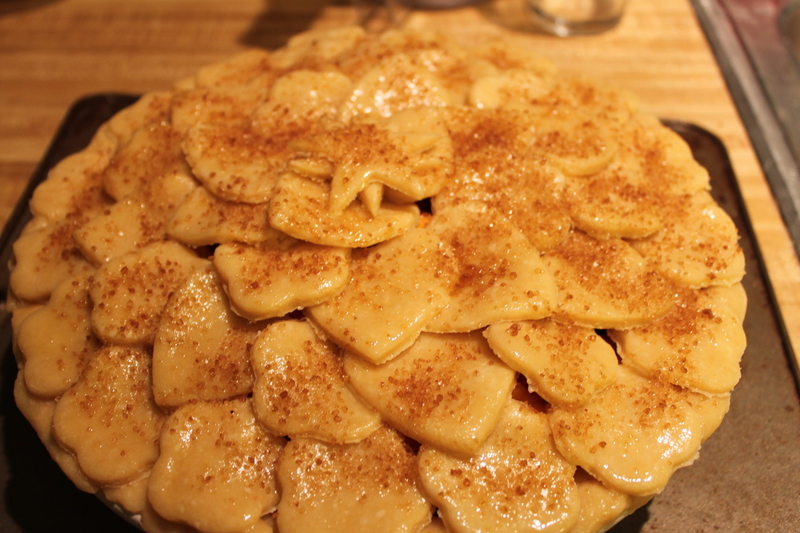 Roll out second disk into 13 inch round and using shaped cookie cutter, cut shapes from dough. 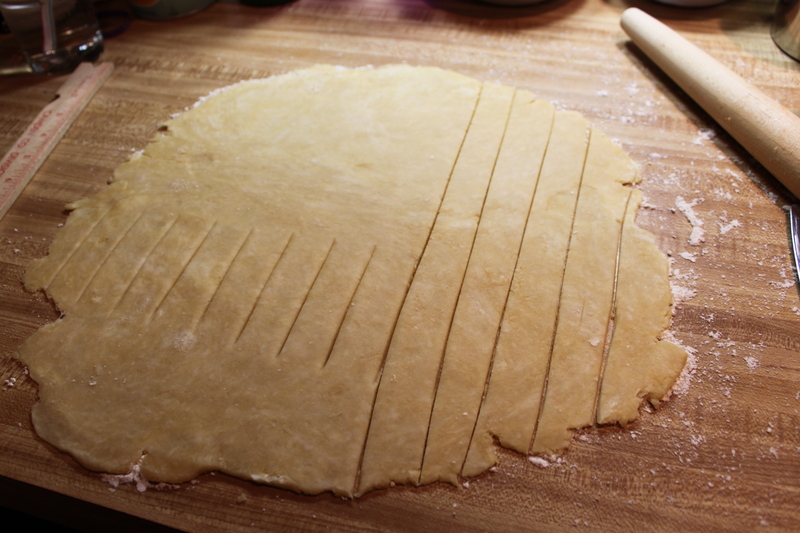 If necessary, remove dough scraps, reroll, and cut out additional shapes for a total of about 25 shapes. Set aside and chill on sheet in fridge while preparing filling. Position rack in center of oven and preheat to 400 degrees. 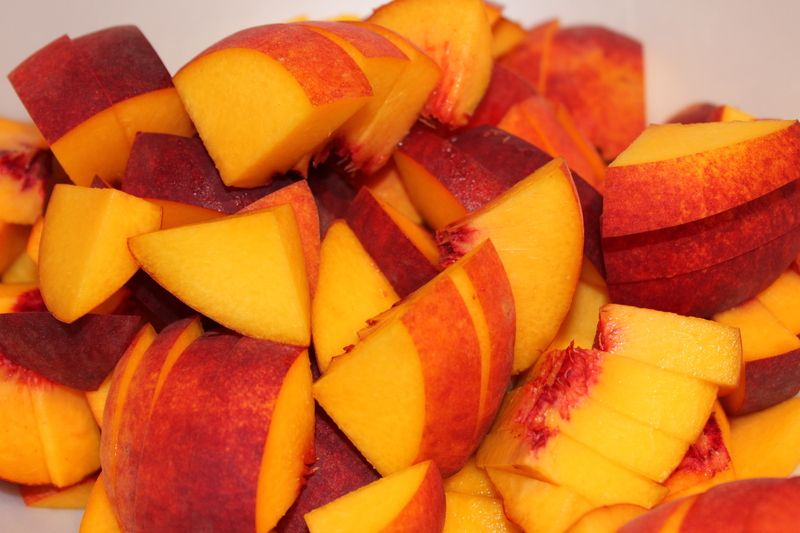 Place peaches in medium bowl and add sugar, cornstarch, lemon juice and cardamom. Toss to coat. Transfer peach filling to prepared pie dish. Carefully arrange dough cutouts on top of filling in concentric circles, slightly overlapping. Cover pie completely. Brush crust with beaten egg, then sprinkle with raw sugar. 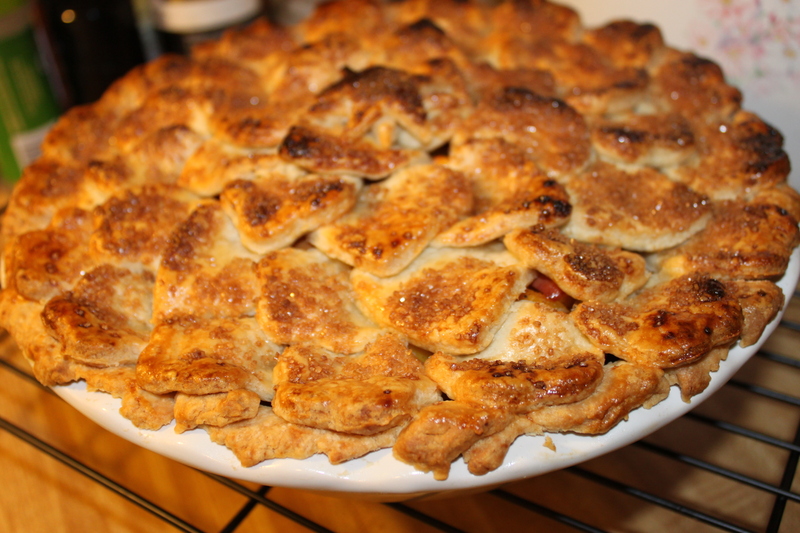 Place pie on rimmed baking sheet. 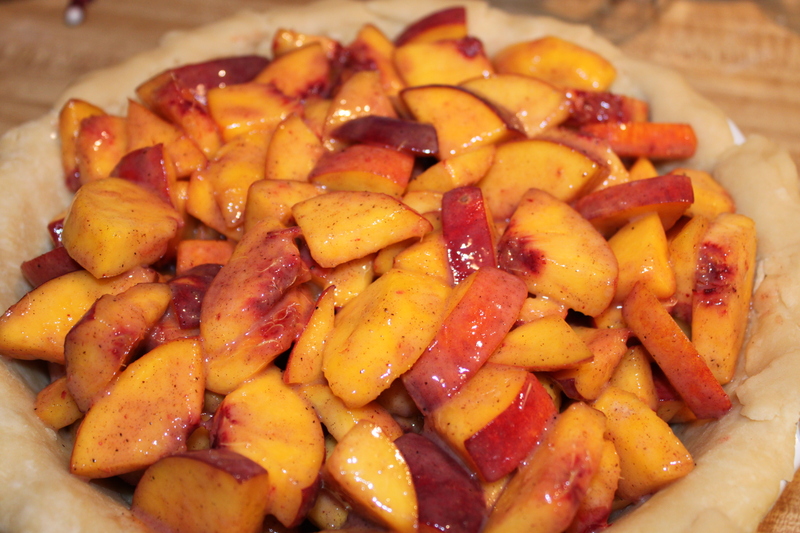 Bake until crust is golden brown, peaches are tender, and juices are bubbling thickly at edges, about 40-45 minutes. Transfer pie to rack and cool at least 30 minutes. * Also called turbinado or demerara sugar; available at most supermarkets and at natural foods stores. But I digress…back to the lamingtons! 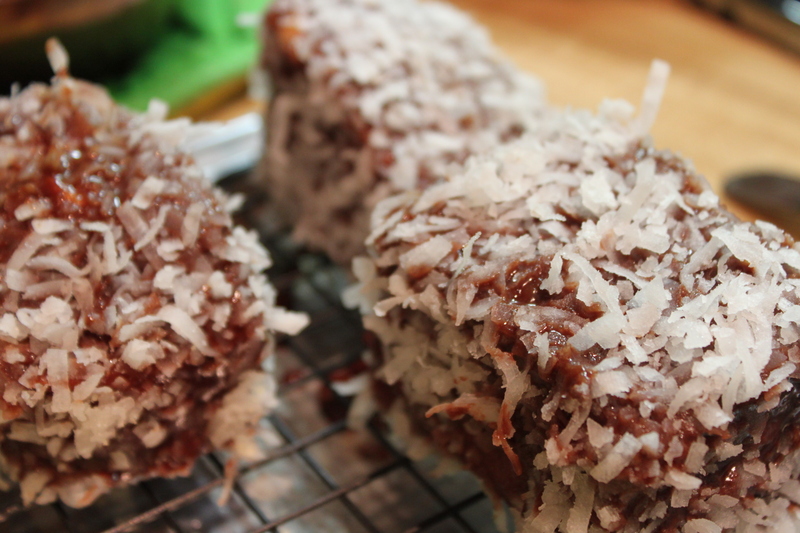 As I said before, lamingtons consist of 3 core ingredients: sponge cake, chocolate, and dessicated coconut. From what I’ve learned, these are a fairly common staple and almost every Aussie household has their own variation on how they prepare it. I was able to find a recipe that seemed within my skill set and time frame to accomplish and set to work. 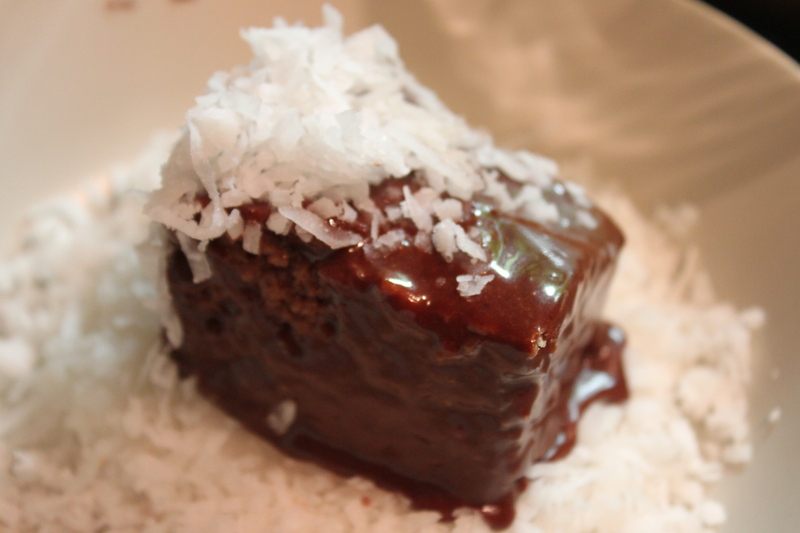 While this may not be the lamington recipe that some of you have had before, it should be fairly close and equally delectable! Not to be confused with the flaky, sweetened coconut that we have here in the states..dessicated coconut is just what it sounds like…dry coconut. Since I wasn’t able to find any here, I went with what I had, the flaky, sweetened stuff and Tim said it wasn’t bad at all. Now I don’t know about you, but I was pleased as punch with his stamp of approval. Yes, it’s true…I am pretty easy to please! Preheat oven to 350 degrees F and center rack in oven. Prepare 8×8 cake pan with baking spray or butter. In a large bowl, sift flour, baking powder and salt. Set aside. Using an electric mixer, cream butter and sugar together until light and fluffy, about 3 minutes. Add eggs, one at a time, beating well after each addition until incorporated and scraping down sides of bowl. Add in vanilla extra and beat until well combined. With mixer on low speed, add in flour mixture and milk, in 3 additions, alternating, beginning and ending with flour. Beat until flour mixture is *just* incorporated. Do not overbeat. Pour batter into prepared pan and smooth top with knife or offset spatula. Bake for 25-30 minutes, until toothpick inserted in center comes out clean. Remove from oven and allow to cool in pan on for 10 minutes before turning cake out onto a wire rack and cooling completely overnight. Make sure cake is completely cooled before preparing icing…cake will need to firm up to be handled. 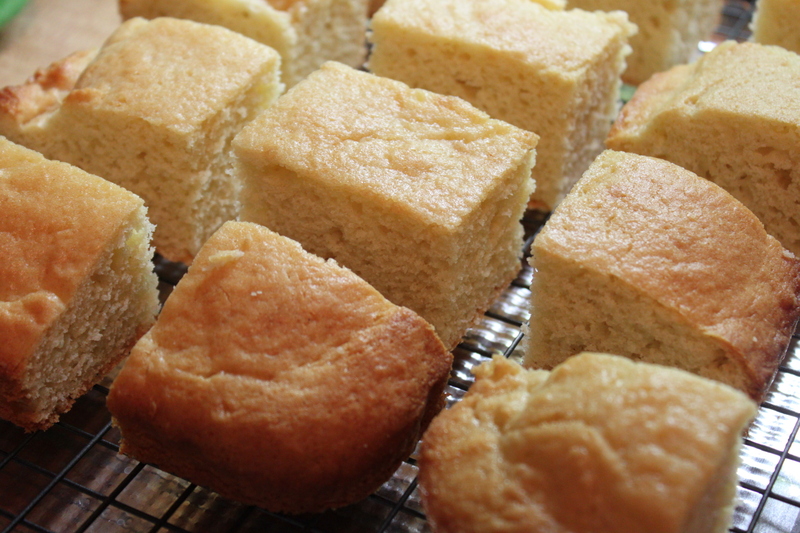 When cake is completely cooled, cut cake into 16 squares and set aside while you prepare the icing. In a large bowl, whisk together confectioner’s sugar and cocoa. In a small heat proof bowl set atop a saucepan of simmering water (I call this the quickie double boiler), heat butter and milk until butter is melted. Whisk in cocoa mixture and continue to stir until mixture becomes smooth. Now to assemble. 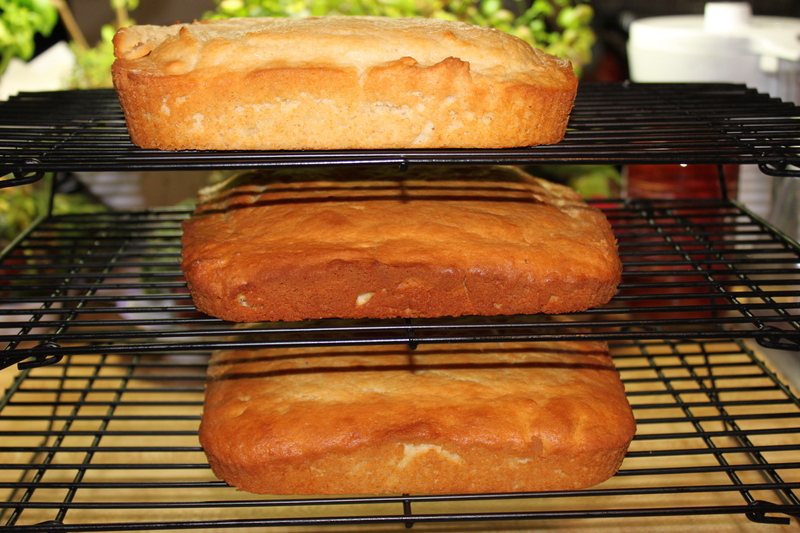 Set a wire rack over a pan to catch any drips and arrange your cake pieces onto the rack. Place coconut in a very shallow bowl and set aside. 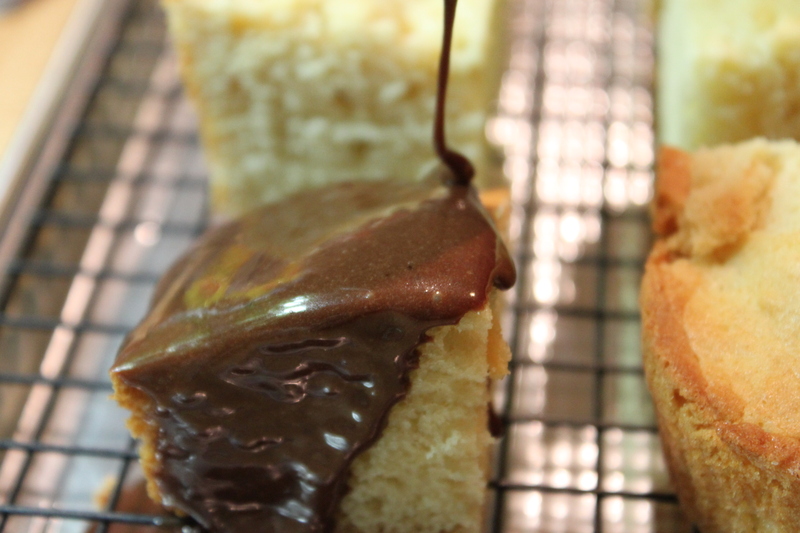 Using a small spoon or ladle, drizzle/pour icing over each cake square until covered. You’ll have to roll each cake over to get the bottoms too. Lift cake out of icing and then roll it in coconut until covered on all sides. Place on prepared wire rack and allow it to set. Again, it’s critical that you’ve allowed the cakes to firm up overnight otherwise, they will completely fall apart during this step. Continue this for each piece until all of your lamingtons are done! Once they’ve set, they may be stored in airtight containers for up to a week. I think we’ve established that I like bitter foods. Be it bitter melon, some broccoli raab, or Brussels sprouts…if it makes your mouth tingle and do a snoopy dance, I’m there! 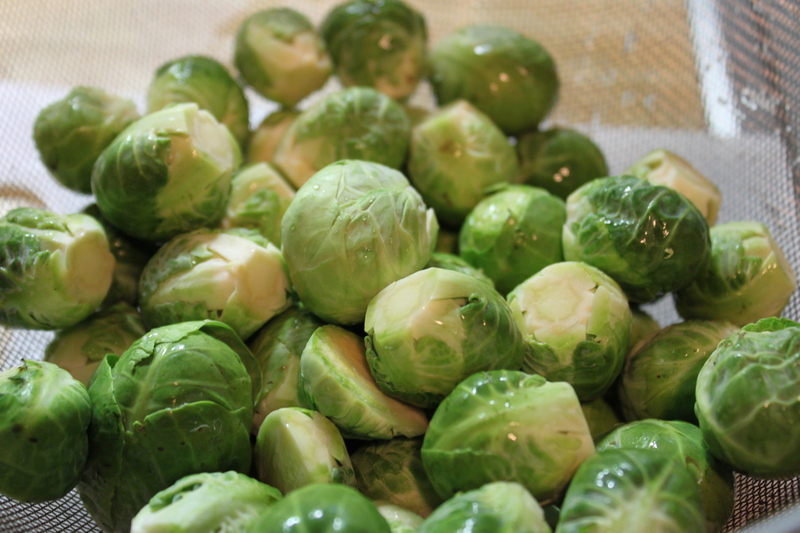 As a kid, I think my mom may have served me Brussels sprouts once…one of those Bird’s Eye “nuke it in this package and GO!” sort of things and, as expected, it was bitter, terrible, and almost scared me off of Brussels sprouts forever…almost. I’ve since had and successfully made Brussels sprouts many different ways as an adult and happily munch on it whenever I get a chance, but I have never yet quite been able to sell this particular veggie off to Alex until I came across this one. To this day, I kind of find it a little sad that my other half doesn’t quite enjoy bitter foods as much as I do…mind you, he can drink the hoppiest beers (you know, the kind that could hair on your chest) without any problems, but give him some sprouts or raab and he’s OUT! So I’m constantly trying to find ways to present these foods that is palatable to him…and luckily, I found one for sprouts! Hhmm, this recipe is both spicy and cheesy? Surely this could work right? Oh, and it does. The cheese here tones down some of the bitterness of the sprouts while the red pepper flakes gives your taste buds something else to think about! The addition of nutmeg and cinnamon add a little extra brightness to the dish and are an unusual and welcome addition. 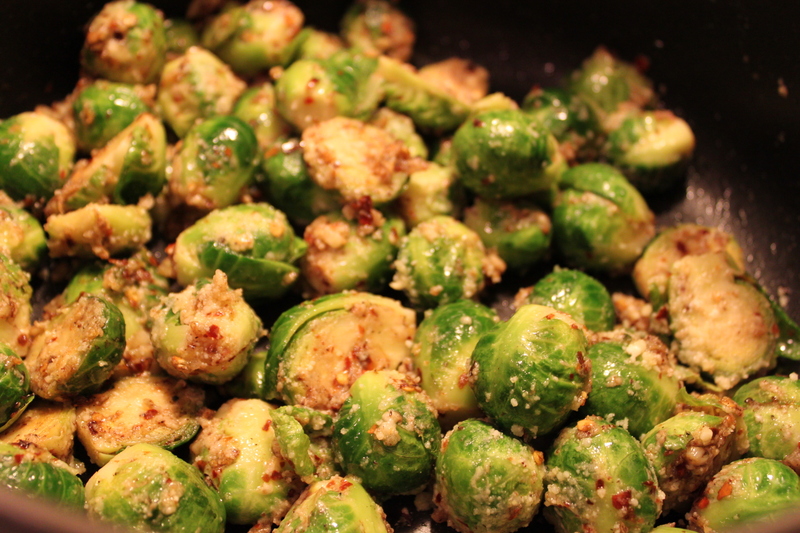 The brussels are boiled to just about done though so they’re still crunchy and have a bit of a bite them too, reminding you that it is, after all, a crisp cabbage like veggie which should never be served soggy. As the original recipe extols…this is the recipe for even those who are staunch sprout haters. This is what I like to think of as the gateway sprout recipe. 🙂 Let the bitter food rage begin! Wash sprouts thorough and trim off ends, discarding any discolored outer leaves. If sprouts are large, cut in half or quarters into manageable, bite sized pieces. Bring 2 quarts of salted water to boil and add sprouts. Boil, uncovered, about 4-5 minutes. Drain well. Sprouts will be a vibrant green color and will just give a bit when prodded with a fork. You want them crunchy tender, don’t overcook! Wipe and dry pot, heat olive oil over medium high heat. 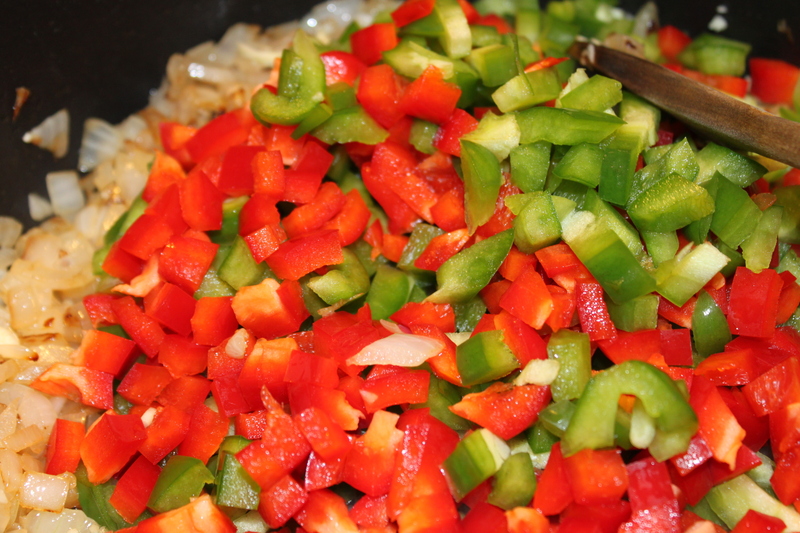 Add in red pepper flakes and garlie and saute for 1 minute, until fragrant. Add sprouts, nutmeg, and cinnamon and saute for an additional minute. 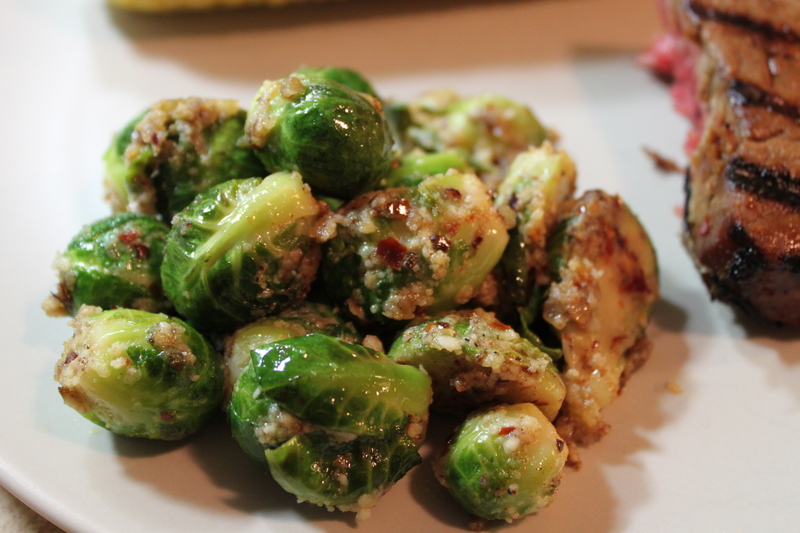 Mix in parmesan cheese and toss with sprouts until melted. 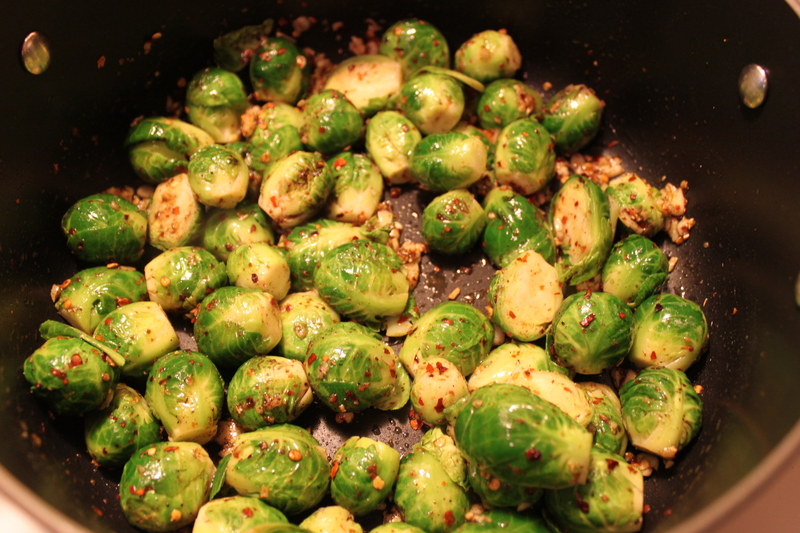 Remove from heat, serve, and watch love of Brussels sprouts begin! At any rate, I decided to finally put down the glue gun, floral tape, and embossing powder to sit down and tell you guys about this particularly fabulous pie that I made over the summer. 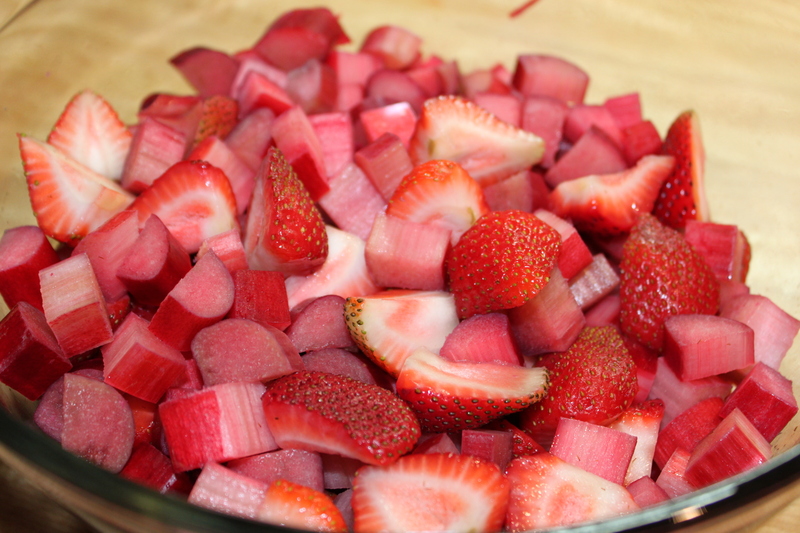 Rhubarb was always one of those strange ingredients that I always remember people talking about and that I’d see in the supermarket, but that I never really knew what it was or how to cook it. I mean, people put this stuff in pies and make all kinds of sweet delicious sounding things out of it, but it all it looked like to me was a boring, nondescript reddish stalk. That’s not fruity or sweet right? Right! 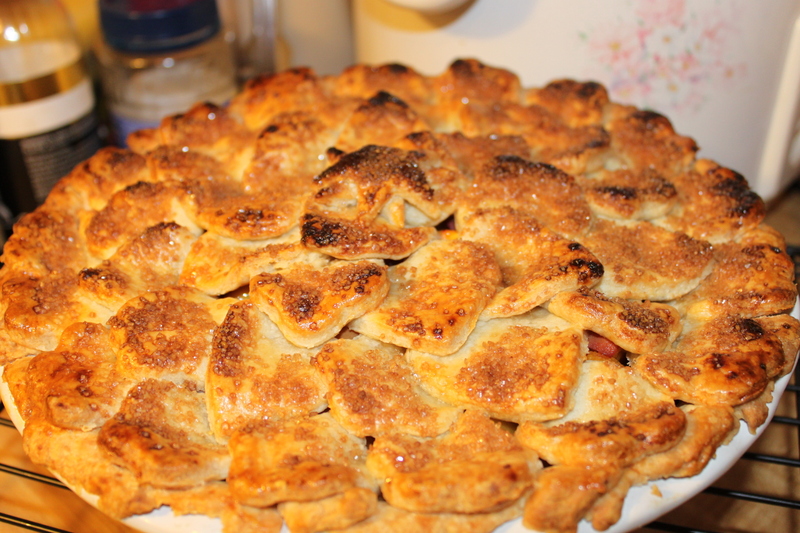 When I was in my 20’s, one of my friend’s mom finally sat me down and had me make rhubarb pies with her and showed me the true path to rhubarb heaven. 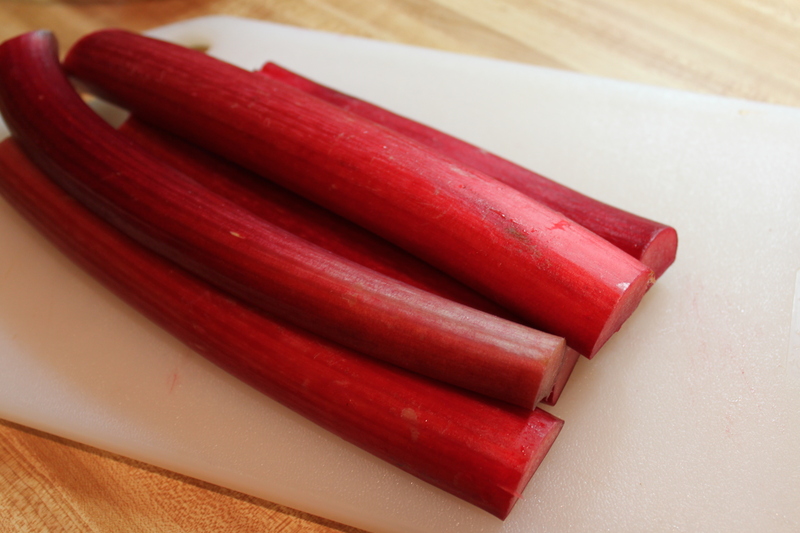 Sour and tangy with just enough power to make your lips pucker and tongue start to salivate, rhubarb is a great backdrop to other sweet fruity flavors, lending a complex sweet/sour twist and guaranteeing a never too cloyingly sweet dessert. Now that’s my kind of dessert! Preparing rhubarb is relatively easy, just make sure you peel the outer “skin” off of each stalk and then cut/trim to required lengths. As far as preparation goes, this is one of the easiest! The rest of the pie comes together very quickly, nothing more than mixing all of the ingredients together and adding to the pie crust. Once baked and cooled, we dug in, and it was every bit as delicious as I had hoped it would be…sweet with a bit of tang that was refreshing and unique. In a large bowl, combine sugar, flour and salt. Using a fork or pastry blender, cut in butter and shortening until a coarse meal forms. Add in and blend 2 tablespoons of ice water at a time until moist clumps form. Gather up all of the bits and pieces of dough into a ball and cut in half. 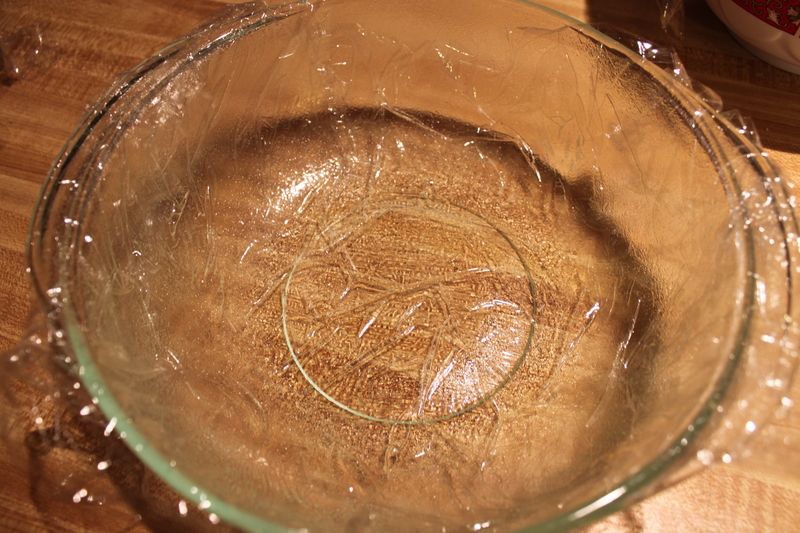 Flatten each half into a dish and wrap separately in plastic. Refrigerate for about 1 hour, or until firm. Can be made up to 1 day ahead and kept chilled in fridge until ready to use. Let dough soften slightly to room temperature before rolling. Preheat oven to 400 degrees. Combine all 7 ingredients for filling in a large bowl and toss gently to blend. On a floured work surface, roll out 1 disk of dough to 13″ round. Transfer to a 9 or 9.5″ glass pie dish, leaving 3/4″ overhand and trimming any excess. Roll out 2nd dough disk on lightly floured surface to 13″ round. Cut into qty 14 1/2″ wide strips. 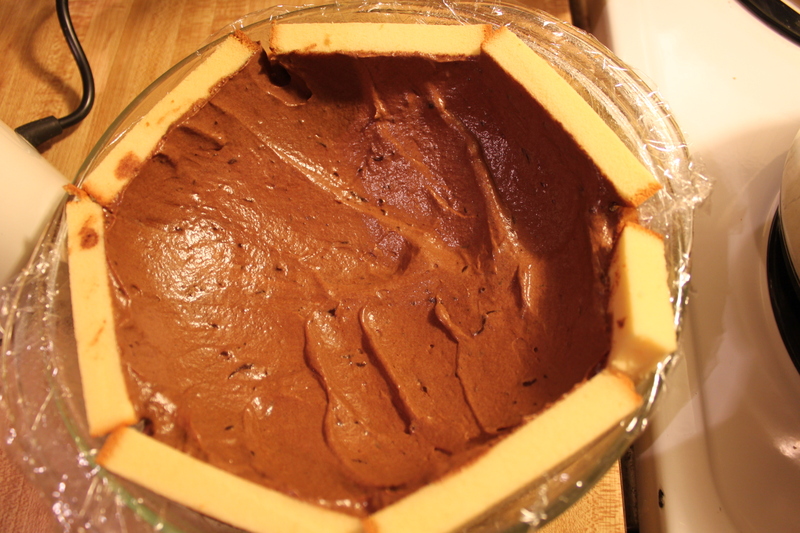 Spoon filling into the crust…there will be juices that have formed, do not pour into the crust. 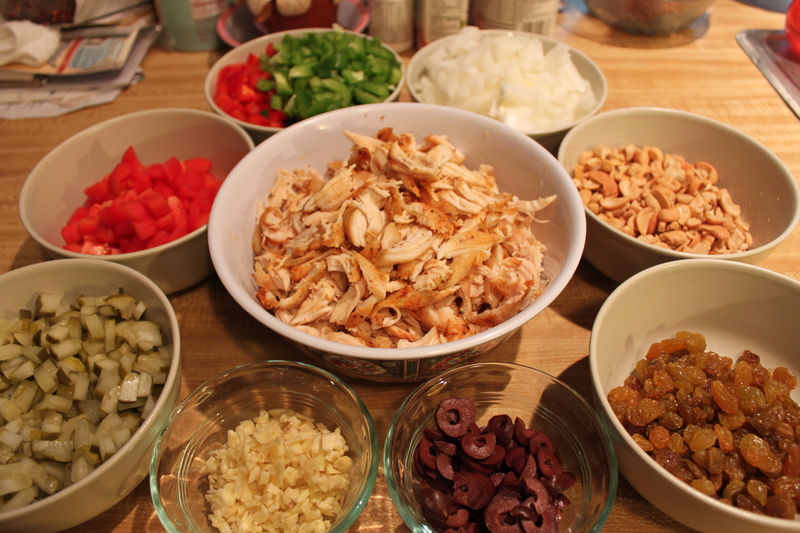 Arrange 7 dough strips atop filling, spacing evenly. Form lattice by placing remaining strips perpendicular to previous strips, weaving if you wish. Trim ends of dough even to overhang of bottom crust. Fold strips ends and overhand under and press to seal. Crimp edges. Transfer prepared pie dish to a baking sheet. Brush glaze over crust and bake for 20 minutes. Reduce oven temp to 350 degrees and continue baking until pie is golden and filling thickens, about another 1 hour and 25 minutes. Prepare to have your house smell like butter heaven. Transfer pie to rack and cool completely before serving. Aruba…When you hear its name, you can’t help but envision white sand beaches, blue waters, sun, and a feeling of relaxation and happiness. Truly, it’s one of my favorite places in this entire world! I’ve been fortunate enough to have vacationed here twice so far and am looking forward to coming here again and again in the future. Not only is it truly “The Happy Island” if not the happiest island I’ve ever been to! I love Aruba for so many reasons…the warm sunny beaches, the water that’s so clear and blue you’d swear that part of the sky just liquified itself here, and its food. Aruba has its fair share of tourist type fare, but if you look hard enough, you’ll find a few places that serve traditional Aruban fare that is both amazing and unique to the island. Now Alex and I, being of the nerdy touristy types, of course pored over our guide book from cover to cover (ok, maybe we didn’t, but when I say “we” it makes me feel less nerdy) and read up on a dish called keshi yena. Aruba, being an island colony of the Netherlands, and being of mostly desert like terrain, has almost all of its food goods shipped in from overseas. Back in the old days, in order to make their food rations last longer, Dutch colonists would reuse the rinds of their cheeses, in this case namely good, amazing Dutch gouda, and stuff it with what they had on hand. 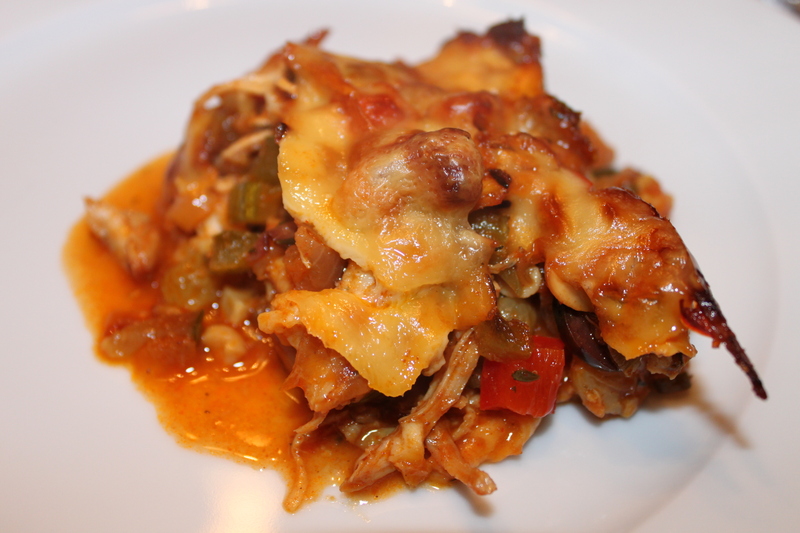 What you get today is a dish that’s basically lightly encased in melted gouda cheese around a filling of shredded chicken or pork, mixed with raisins, veggies, nuts, and a little bit of heaven. As soon as I read about this, I HAD to have it. Alex and I went to 2 separate restaurants in Aruba and did our keshi yena research. What we’ve found is that each place has its own rendition of keshi yena that was an illustration of each restaurant’s respective culinary style…the common themes between both iterations of the dish were the gouda cheese (yay!) and the tomato based sauce. What this meant to me was that each keshi yena has its own personality and that this is a dish that is very easily modified to best convey your own personality and culinary style! Once we returned home, I set to work creating my own version of keshi yena which I share with you below. It does take a little bit of time getting together the ingredients and, while it may seem like a lot, trust me, it is soooo worth it. The smells that began emanating from our oven as it was cooking were absolutely divine and they did not disappoint on its promise of being an amazing dish! ***Liz note: For this time around, I seasoned about 1.5lbs of chicken tenderloins with salt, pepper, and garlic powder and then baked it in the oven at 400 degrees for about 10-13 minutes until the juices ran clear. I’ve also made this dish with just plain boiled chicken with equally good results. I personally prefer the roasted/grilled method, but only if time permits. Preheat oven to 350 degrees and prepare a 9×13 baking dish by spraying with nonstick cooking spray and then layer with 1/2 of the sliced gouda on the bottom. In a large bowl or mixing cup, mix together ketchup, worcestershire sauce, thyme, curry, paprika, and chipotle, if using, until well combined. Set aside. In a large pot, heat about 1 tablespoon of olive oil over medium high heat till it shimmers. Add in onions and fry until golden brown, about 7 minutes. Add in garlic and continue to fry for an additional minute. 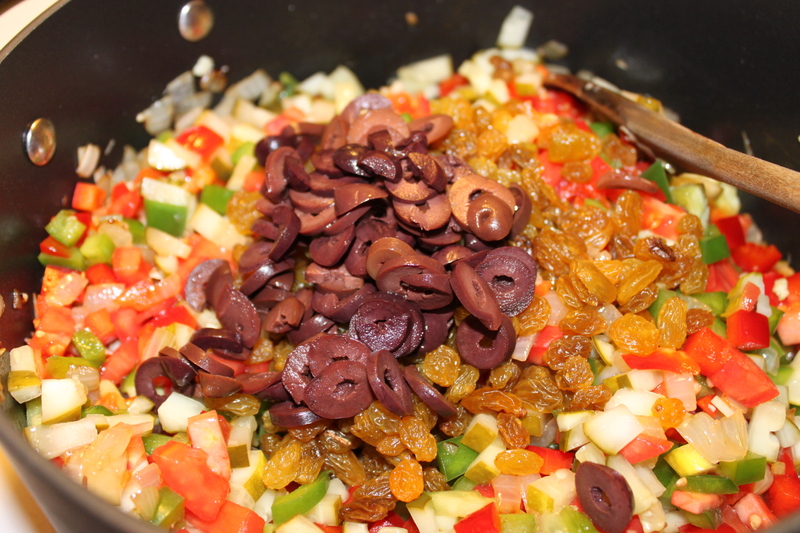 Add in both red and green bell peppers, tomatoes, pickles, olives, raisins, and cashews and mix well before adding in chicken. Stir in ketchup mixture to pot until well combined. 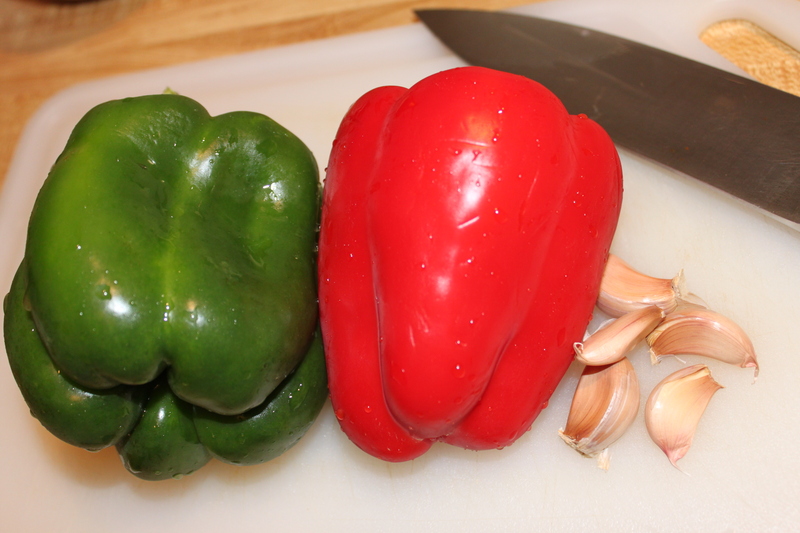 By now, the kitchen will start to smell amazing! 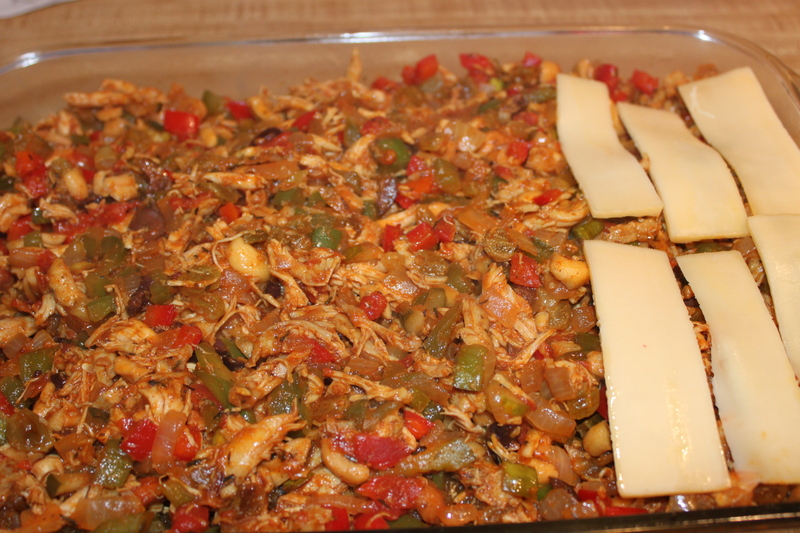 Pour mixture into prepared baking pan lined with gouda. Smooth mixture and top with remaining gouda slices. Bake in oven for about 30 minutes or until cheese is melted and slightly golden at the edges.